The Center for Holistic Instruction was formed to provide classes, seminars and workshops for individuals and groups who want to expand their knowledge of the human mind, body and spirit through holistic methods. Call: (704) 907-5735 for information and registration. Conversations about peng and the manifestation of chi. Taiji is a centuries old Chinese discipline for health, relaxation, balance, flexibility, strength, meditation, self-defense and self-cultivation. It improves circulation, balance, coordination, and helps relax and strengthen the muscular and nervous systems. The stretching movements make the body limber, tone up muscles, and help release tension. As a meditation, Taiji is a way of harmonizing body, mind and spirit, dynamically. Taiji warm-ups -Introduction to taiji - Tai Chi Warm-up is a specific set of easy to do circular and spiral movements designed to aid in opening and lubricating all the joints of the body. Anyone of can learn and benefit from doing Tai Chi Warm-up. You do not have to be a taichi practitioner to do Tai Chi Warm-up. The graceful, flowing movements are fun and relaxing. Tai Chi Warm-up uses mind-intent to move from the core through a series of physical and mental exercises that allow you to release stress, detoxify the body, and improve overall circulation. This is great way to prepare for doing your taichi routine (form), or to use in place of taichi when your time is limited. This is an excellent exercise for senior citizens to do every day. gravity, greatly aiding Qi flow. Yang Style Simplified Form is a set of taiji forms created for the city people, in China, It is easier and requires a shorter time to practice. It is now the most popular and widely practiced throughout the world. It is used to stimulate the internal organs, gently exercise the body, calm the nervous system and mobilize the joints. Silk reeling - posture exercises that are used to develop the spiraling power and to open up all the major joints of the body. The NIH office for Complementary and Integrative Medicine (NCCAM) says that Qigong and Tai Chi is Mind-Body Medicine. teaches Chinese T'ai Chi for CHI. His 52 years of experience in Chinese martial arts provides an excellent opportunity to obtain the best instruction in the area. He has studied with several Tai Chi instructors over the years, but studied most intensively the Yang style T'ai Chi with Todd Qian (Chian) of Shanghai, China. Joe is a Certified Taichi/Qigong Instructor with the Healing Tao USA where he studied with Mantak Chia and others in the Healing Tao Instructor's Association. Joe is President of the Esoma Society of Martial Arts, founder Esoma Kungfu, head instructor of the Silver Dragon Kung fu Academy, and head instructor of T'ai Chi at the Lake. He taught at Central Piedmont Community College for 10 years before coming to teach in Davidson in 1987. Grandmaster Joe Martin with his latest teacher, Todd Qian (Qian Xinyu). 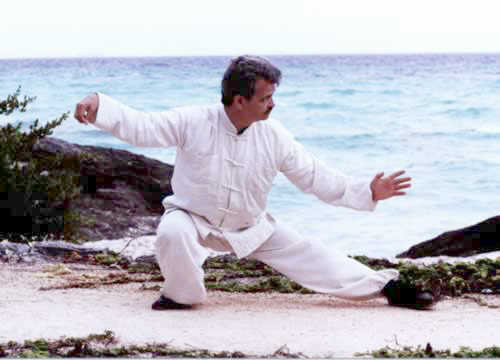 Joe Martin is a Certified Instructor of Mantak Chia's Tai Chi/Chi Gong Method of Tai Chi. 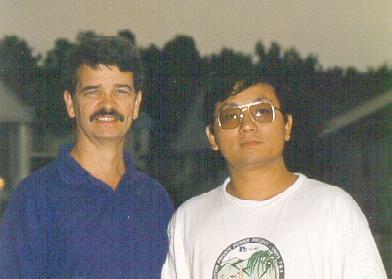 Click here for photo of Joe Martin and Mantak Chia. T'ai Chi Classes are available Tuesday and Thursday evenings 6:30 to 7:30.